Maybe that fancy Torqueedo control electronics will tell you how much current or power you are getting from the solar. If so, you could start with a partially discharged battery so that the controller will be trying to use as much power as the solar will put out. Then see how little things like the sheet rope shadow over the panel affects the power output. Its hard to predict how much power you lose from shading but its very significant even for something as small as the sheet line shadow. A narrow shadow along the edge of the solar panels from the PVC riser.. I would not be surprised at 50% reduction in generated power. I wish it showed the power input. It does show the net usage so I could close the panel, set the throttle to 100 watts, then open the panel up and see the reduction, test shading, etc. I also notice the charging light and indicator on the computer, if I partially obscure the panel both of those indicators go away immediately. Thank you for providing valuable info on the use of the solar panel. This will help anyone else who is interested. Finally got a weekend to work on the first prototype for a scupper-based Torqeedo mount. It took a few hours to build (more time to shop for the parts ), and I tried it today with good results. The idea was to have a mount that can be close to a front-riding position, but also usable on the back. That called for the scuppers to be used. The Hollaender system for pipe structures makes it trivial to build, very light and rock-solid. It could also be done using PVC (with some trickery in the scupper-inserted section to maximize the area filled by the pipes. * To eliminate rotation of the motor shaft without resourcing to a fixed (as in "glued") attachment: in my previous attempt using Tom Kirkman's method I wasn't able to fix the shaft reliably using the pipe conduits for long (after a while, the vibration loosened the grip). So I used 30 mm aluminum shaft collars. In this first prototype I used two collars on top, the lower one drilled to pass a couple nails into the PVC holder to eliminate rotation, the other (on top) to keep the nails in place. My next prototype will tap the shaft collar and the PVC container so that a bolt can be used instead (and no second collar). For now, the chosen design keeps the shaft solidly rotation-free. * To produce a good fit between the vertical pipes and the scuppers. The scuppers have a diameter that is (a) not uniform and (b) not-standard, which means hard to perfectly fit for any specific pipe size (PVC or Hollaender). I could have used other pipes that fit better, but at the extra complication of drilling the fixtures out of blocks (nylon, wood, etc.) as opposed to using pre-fit fixtures. Not interested in the extra work. * Totally reversible from side to side in about a minute. * Using nylon 5/16-18 bolts instead of the Hollaender system set screws. This requires tapping the pipes, and continuing the thread from the fixtures into the pipe, which takes a little extra time. The nylon bolts provide safety as they will brake on impact of the motor agains rocks or bottom, letting the axis rotate circularly towards the back and the motor to come up naturally as a result (just as the threaded rod I used in the TK design). Right now, it is very simple to loosen the set screw on the elbow outside the boat, but time may not be available to do so: a nylon one would simply just break and let the motor up. 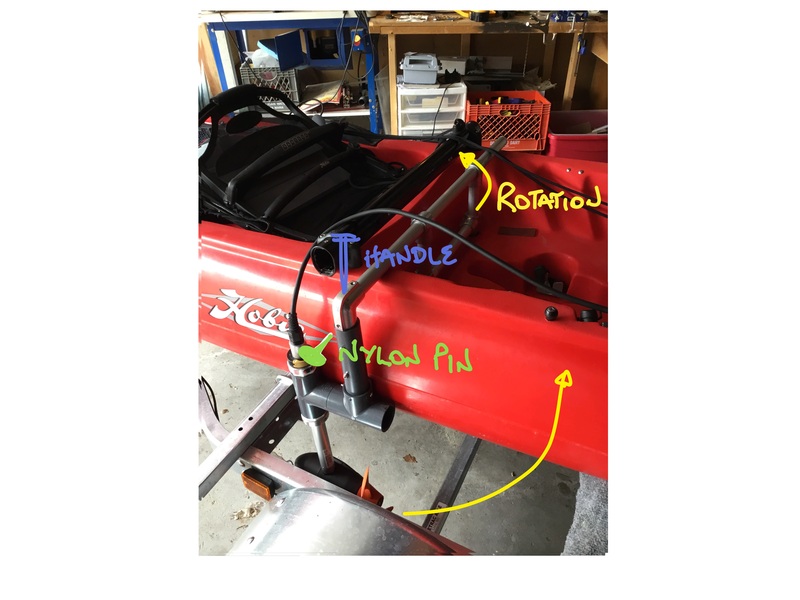 * Possibly adding a "tiller" to rotate the motor on its axis after removing the bolts in the point above (I am not sure there is a real benefit to that, the kayak has a rudder). Notice that the upper and lower shaft collars transform the PVC "tee" in which the shaft is centered into a bushing of sorts. * Possibly adding the aluminum "wing". I have not observed "cavitation" (sorry, I use the term loosely, because it has been used already in the thread), so I don't know if i will need to. I would prefer to avoid it because it would sacrifice the ability to move the motor up and down as needed) (The area below the PVC tee is submerged and it would change in length). After trying it today, I am optimistic about the design. I will update when the second version is finished. And thanks for this very useful thread, and all the information shared in it. This is an elegant design and you've done excellent work here. I'm just a bit confused concerning the advantages over the original mount. Any clarification would be appreciated. Also, how is the motor raised when in shallow or hazardous waters? I have to raise my motor completely out of the water often to avoid damage from sand, rocks, etc., and also when loading/unloading. All of these mechanisms are temporary, but for now work about as easily as the PVC frame that fits on the rod holder. In my case, I don't have to worry about shallow waters, so it works exceedingly well for me. As shared in my main post, I plan to use a safety nylon pin passing through both the L fitting on the side and the pipe that holds the shaft (right now the pipe is held by a set screw). The pin will stop rotation around the main horizontal axis when in fixed position but allowing it to break on impact and let the motor swing up even if the horizontal axis is fixed. My next iteration will allow me to rotate the horizontal axis using just a handle that locks in two positions. To use it, I will just rotate my body to the side, grab the handle, and rotate it 90 degrees towards the front (which would correspond to the motor shaft rotating toward the back 90 degrees). The handle itself would be created by extending the vertical pipe and using a tee on the side as opposed to an elbow. This is a very simple addition, which i will get to hopefully soon. * Used nylon bolts to hold the horizontal axis in one of two rotational positions (so that the nylon pin would break on impact of the motor on the bottom). * Rotation of the shaft around the horizontal axis works great, and it is very simple to lift the motor. When rotating the motor backwards, the aka's diagonal brace obstructs a full 90 degree rotation, but still there is enough clearance for the motor to clear the bottom of the TI any way. * Using a nylon safety pin on the rotating horizontal axis doesn't work: the motor shaft acts as a lever, and combined with the power of the motor, cuts a 5/16-18 nylon pin even before the motor gets to full power. So I replaced the pin with a metal bolt for now. I will experiment with more than one pin next time. * I also shortened the horizontal axis to make it easy to lift the motor. Big improvement. However, the motor can't be used as a rudder. It could, but because the position of the motor is not at the end of the TI, it may not be very efficient (?). I doubt I will get to try this, I am OK with that "limitation": it is not my intention to turn the TI into a motor boat, just to have an alternative mobility source. Also, at this point, I haven't implemented yet a safety auto-lift on impact (which can be done, and will be part of the next iteration). Pictures will be coming later this week when I can get to the boat. I just made mine fit in the drive well and it works. We have good wind most days so I barely use mine. Even thought about selling it. I just made mine fit in the drive well and it works. We have good wind most days so I barely use mine. Nice! The drive option is nice also, do you have the Torqeedo adapter with the "lance" that aligns the rotor? And yes, as I was taking the pictures below, I realized how easy it is rotate the vertical rod around its vertical centerline as well... I will try it at some point. Nope I just make sure pull the kill magnet and just stick my hand down to rotate it. Only down side is if I hit something there is no where to go. So I only use it in deep water. Once it gets shallow it’s up and I am back to pedaling. Great info, thanks. I ran across a mounting approach on FB where the 403 is attached farther up the side of the TI rather than right at the stern. I’m wondering what the performance differences might be for this mounting approach. This has some appeal to me as I can’t accommodate any more boat length at my storage location. I have a picture but don’t seem to be able to post it (or just don’t know how). Before you go through the trouble of mounting the 403 on the side, please be aware that it very easily pops off the horizontal shaft for trailering and storing. So if you don't have enough room to accommodate any more length at your storage location, you can simply remove it. I did this for years. I wanted to give an update on my usage of the 403 with the solar panel charging. Everything worked great for about a month. I'd use about 2/3 of the battery on an 8 mile round trip to the gulf and back. The solar panel would fully charge the battery in about 2 days so as long as I waited a day between trip it was ready to go again. I thought that my approach would greatly extend the life of the system, never having to disconnect a cable and creating opportunities for water and corrosion to mess things up. Unfortunately, there is something I didn't account for with the design... rain. I'll end up buying a new battery vs. accepting their $30 discount. It was pretty disappointing that they were not more helpful and wouldn't even send me my broken battery back! Since I have to buy a new battery I'm going to go ahead and get the 900 Watt version. That will give me a huge buffer of usage between when I need the power and the slow trickle recharge from the sun. Do you guys have any suggestions on how I can protect the battery from the deadly water in the sky? My current line of thinking is to get a medium size cooler and keep the battery in that. I'd cut a whole for the cables to come out and put some kind of rain cover over it. I'm definitely open to alternative ideas. The 'silver lining' is that with the red tide I've not missed out on good sailing while waiting for Torqeedo to offer support and I'll proabbly have plenty of time get a new system up and running before the red tide clears out. Here's the link to pictures of the side-mount approach I saw on FB. Thoughts? It seems a little less exposed than hanging it off the stern. That looks great! Now I want to see a dual mount system with one on each side. One on each side AND one off the stern.